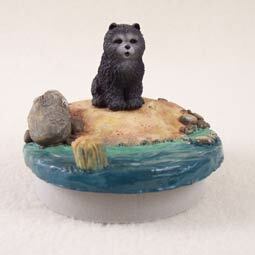 Chow Blue Candle Topper Tiny One "A Day on the Beach"
Home > Dogs All > Chow Blue > Chow Blue Candle Topper Tiny One "A Day on the Beach"
The Chow Chow is one of the oldest dog breeds known today. It has been seen on pottery from over 2000 years ago and has remained basically unchanged since then. Their lion-like coat can come in five colors, red, black, blue, cinnamon and cream and should be bathed and groomed regularly. Their best known trait is their blue/black tongues and stilted gait. This breed is very cat like, making them much more independent, stubborn and less eager to please than other dog breeds so owners must train and socialize their Chow early and often. The AKC recognized the Chow Chow in 1903 in the Non-Sporting Group. They range in size from 17 to 20 inches tall at the withers and are wonderful hunters and guard dogs.